Get sizzling color and electrifying designs in just 3 easy steps. 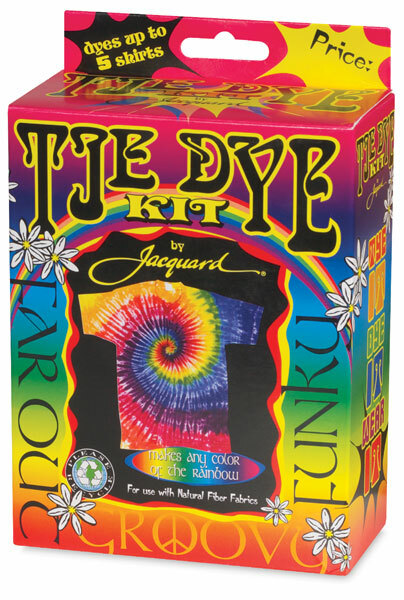 This professional-quality kit supplies enough to make 5 adult-sized T-shirts, or any natural fiber garment of equal quantity. Finished projects are colorfast and stay brilliant after repeat washings. Primary colored Procion MX dye powder is pre-measured and ready to mix with tap water in convenient applicator bottles. The kit contains the following materials. 3 applicator bottles with Red, Blue, and Yellow Procion MX dye. Instructions for making spiral, stripe, and geometric patterns. Procion MX is one of the most vivid and versatile dyes for plant fibers such as cotton, linen, rayon and more. 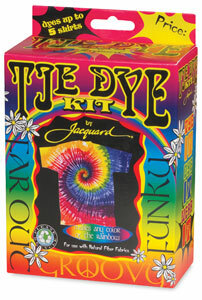 Watch this impressive tie dye demonstration using the Procion Dye to create a spiral effect on a tee-shirt. Then try it at home or in the classroom!